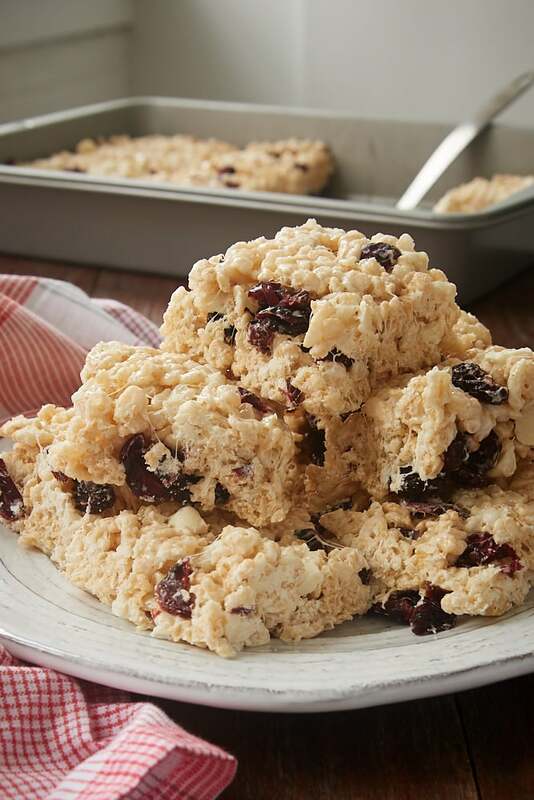 Cranberry White Chocolate Crispy Treats are a quick and easy, no-bake addition to your baking list. With sweet white chocolate and tart cranberries, these bars are a wonderful twist on a classic dessert. When you’re looking for a simple, quick, easy, crowd-pleasing dessert, it’s tough to beat rice crispy treats. With no oven time, a short list of ingredients, and a quick prep time, these sweet, gooey bars are always a favorite to make, eat, and share. 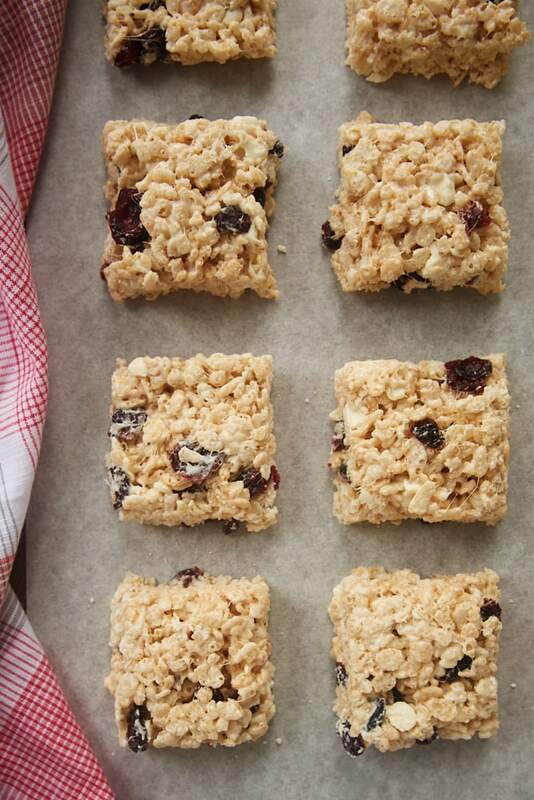 And these Cranberry White Chocolate Crispy Treats are no exception. For a little holiday twist on the classic rice crispy treats, what better flavors to incorporate than cranberries and white chocolate? Of course, I’ll happily enjoy these Cranberry White Chocolate Crispy Treats all year long, but these flavors seem to lend themselves to this time of year so well. If you’ve ever made rice crispy treats, you won’t find any surprises here. Marshmallows, butter, and crisp rice cereal get things started in the usual way. But then the white chocolate and cranberries show up to make them a lot more interesting. The white chocolate will get a little melty when you stir it into the warm cereal mixture. That means you’ll get a nice combination of a little melted white chocolate along with the chips. Cranberries and white chocolate are a wonderful flavor pairing, but you can easily substitute another dried fruit if you like. Personally, I like dried cherries with white chocolate a lot, too. There are so many dried fruits available now that the possibilities are virtually endless! 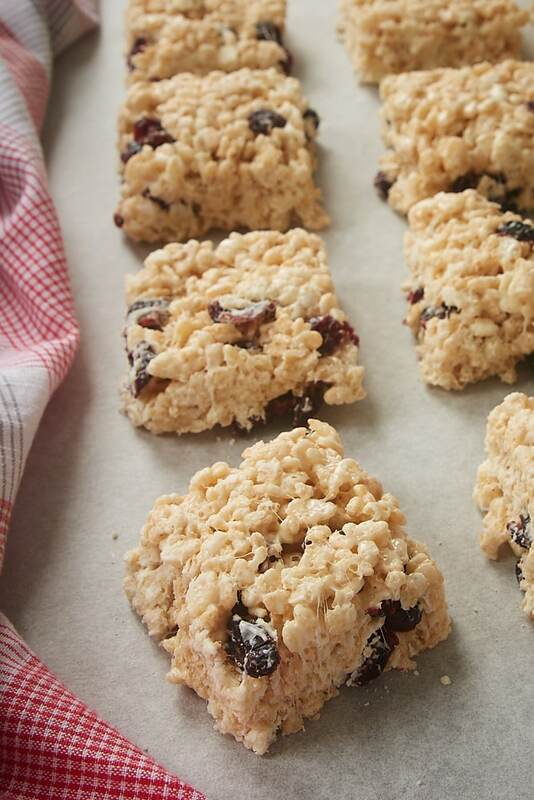 With all of the cookie baking and special dessert baking that goes on during the holiday season, it’s nice to have a simple recipe like these Cranberry White Chocolate Crispy Treats in your arsenal for an easy addition to your holiday treats list. 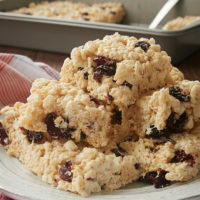 Cranberry White Chocolate Crispy Treats are simple yet fantastic twist on classic rice crispy treats. Love this flavor combination! Lightly grease a 9″x 13″x 2″ baking pan. Place the butter in a large saucepan. Cook over medium-low heat until the butter melts. Add the marshmallows, and cook, stirring constantly, until the marshmallows have melted and the mixture is smooth. Remove the pan from the heat. Add the cereal, and stir until combined. Stir in the white chocolate chips and cranberries. Save some to sprinkle on top if you like. Transfer the mixture to the prepared pan, and spread evenly.